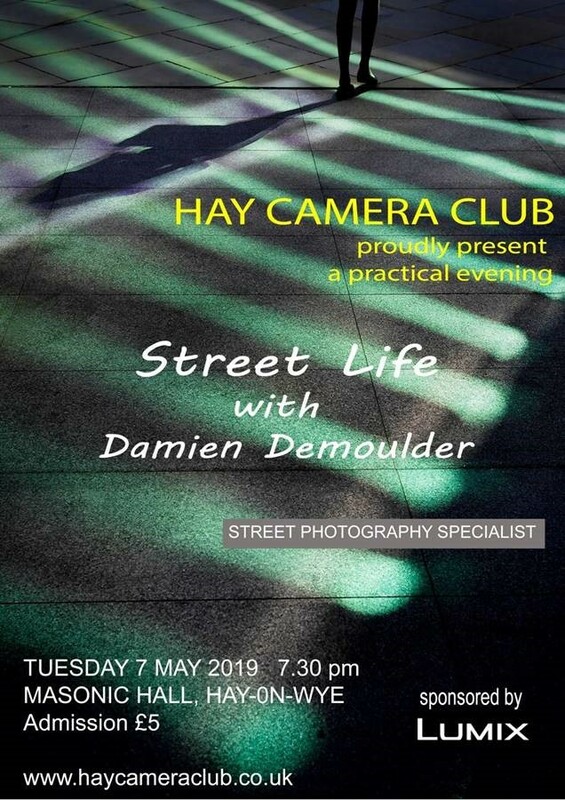 Hay Camera Club has invited Damien Demolder to give a special presentation with some instruction at a club meeting on Tuesday 7th May 2019, starting at 7.30pm. The evening is about street photography for which our speaker has a national reputation. Damien is a photographer, journalist and photographic equipment expert, speaker, judge and educator. He has worked in the photographic publishing industry since 1997, including 15 years at the world’s only weekly photo magazine, Amateur Photographer, where he was editor. He writes for regularly for DP Review, and British Journal of Photography magazine as well as occasionally for other UK and international photographic magazines and websites. We would love to see members from other clubs at this event. There will be a charge of £5 per person to cover costs of hall hire and the speaker. If you can come, I would be grateful for a very short reply indicating approximate number, either to admin@haycameraclub.co.uk or by phoning me on 01874 676225. We meet in the Masonic Hall, Brecon Road, Hay-on-Wye. The hall is about 100 yards Hay side of the fire station, on the opposite side of the road. There is a car park almost opposite and if full, it is easy to park a bit further into Hay and walk back to the hall.